DC has more historic buildings than Boston, Chicago, and Philadelphia combined. Why? These are not historic buildings. Nor should they be. Image by the author. Nearly one in five properties in DC are protected by local historic designation laws — thousands more than in bigger, older American cities. While this policy has ensured harmonious architecture across much of central Washington, it also means that Washingtonians are much more likely than residents of other cities to have their construction plans delayed or denied on subjective grounds by a historic review board. This has repercussions for the District's ability to adapt its built environment to changing circumstances. Data from National Trust for Historic Preservation. Image by the author. Another National Trust report puts that figure into perspective. Boston has a population remarkably similar to DC's, was founded 161 years earlier, and obviously played a key role in American history. 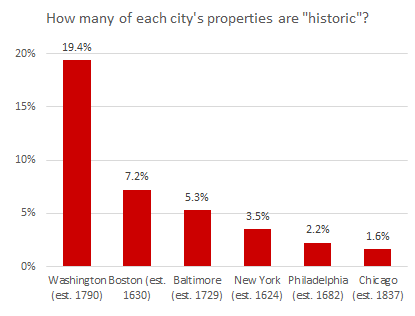 Yet it has less than one fourth as many locally-designated historic properties as DC. Compared to bigger cities like New York City, Philadelphia, and Chicago — all of which incorporate large swaths of unremarkable residential and industrial areas alongside their splendid central cities — the difference is even more stark. For instance, DC has designated three times as many local historic buildings as Chicago, even though Chicago (no slouch in terms of its contributions to American architecture and history) has four times as many properties. New York City just beats DC in the number of historic structures (over 30,000) but NYC, of course, buries us in terms of buildings (6.4 times as many). DC is so prolific at handing out historic designations that we have more historic properties than the cities of Boston, Chicago, and Philadelphia combined, which together have almost eight times as many properties as DC. Although DC is undoubtedly a place of great importance to the nation’s history, it seems doubtful that any given building here is three times as likely to be a historic treasure than one in Boston, nine times as likely as in Philadelphia, or 12 times as likely as in Chicago. It's unlikely that DC's over-use of historic preservation is related to its role as the capital, or semantics. Federal interest: It's unlikely that the large number of District-designated historic buildings is related to the need to protect federal interests; the mighty federal government is more than capable of doing that without the District's help. Long before DC even had home rule, the Shipstead-Luce Act granted the Commission on Fine Arts broad latitude to protect the views from key federal sites. National Register vs. local landmark: Historic designation comes with both “carrots” and “sticks” — tax incentives for renovations, as well as requirements and appearance guidelines that any changes to the building must meet. A listing on the National Register of Historic Places, which is maintained by the National Park Service, comes with carrots — namely, a chance at federal and local tax credit and incentive programs. Local historic designation usually comes with regulations, and sometimes incentives. In DC, it prevents an owner from demolishing a building — but it also prevents a shop owner from replacing a broken door without first having to consult an array of design professionals and city agencies, who might or might not hold up the project for months. 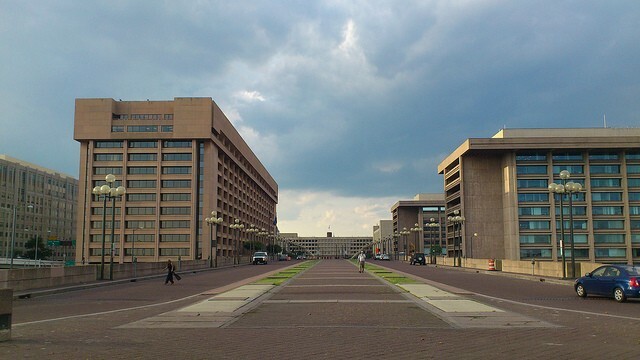 In DC, the designations are administered by the Historic Preservation Review Board, which was established in 1978. Many buildings are on the National Register but not locally designated as historic; this allows their owners to benefit from the federal incentives without additional local regulation. DC's practice, on the other hand, has been to jointly designate all historic buildings for both the federal and local registries. Yet even when just National Register entries are considered, DC remains far more enthusiastic about designating historic structures than larger and equally historic cities: our 620 NRHP entries (many of which are districts, encompassing dozens or even thousands of buildings) outnumber the 569 in Philadelphia, 379 in Chicago, or 284 in Boston. So what does explain it? There are several factors that could explain why historic preservation is so much more extensive in DC than in other cities. Legal precedent: A recent amicus brief filed by the libertarian Cato Institute links the discrepancy between cities' historic designation patterns to differing federal courts' interpretations of preservation law. It points to legal precedents that hold municipalities in Delaware, Illinois, Indiana, Pennsylvania, New Jersey, and Wisconsin to a tougher standard when designating historic buildings or making other land-use regulations, especially when an affected property owner objects. The DC circuit court, on the other hand, has not been known to favor property rights over land regulators. Expansive historic districts: Some of the buildings on DC’s Inventory of Historic Sites are designated as individual historic landmarks, but most of DC’s historically designated buildings are located within one of its 53 historic districts. Historic landmarks are individual buildings which are judged to be historically significant; historic districts are considered significant in their totality, and within them are both “contributing structures” (those that fit in with the district’s legally defined physical character) or “non-contributing structures” (which don’t fit in as closely). The largest of DC’s historic districts, on Capitol Hill, encompasses over 8,000 buildings and 150 city blocks. Other cities have historic districts, but theirs tend to be considerably smaller. For instance, New York’s largest historic district covers over 60 blocks in Park Slope, and Chicago’s largest covers just 20 blocks of Pullman. Historic districts in DC as of 2014. Image by DC Office of Planning. Because each historic district is listed only once on the National Register, this helps to explain why DC has so many more historic properties than National Register listings. For instance, DC has four times as many historic properties than Boston but only twice as many National Register listings. A willy-nilly approach to preservation. DC’s historic preservation process invites anyone to apply for designation of any structure. The criteria for historic designation have proven so vague that just about any structure qualifies, provided someone's willing to spend the time and effort to recite its history. Every building has a history, and so every building must be historic, right? Very few applications are unfavorably reviewed by planning staff, or denied by the Historic Preservation Review Board. From 2004 through 2016, 213 historic designation applications were submitted, of which only 18 were denied. In 2016, all 21 applications that were submitted were approved, for a pass rate of 100%. Inviting everyone to designate everything, and then rarely saying no, has allowed the inventory of historic sites to balloon. Over that same time period, 169 new historic designations were approved, adding thousands more properties to the rolls. A more discerning approach would do a better job of protecting the historic sites that truly matter, while leaving less leeway for those who simply want to use preservation as a legal cudgel to freeze a building in time. Payton Chung, LEED AP ND, CNUa, sees the promises and perils of planning every day as a resident of the Southwest Urban Renewal Area. He first addressed a city council about smart growth in 1996, accidentally authored Chicago’s inclusionary housing law, and blogs at west north. If you are at the 5th St DC Streetcar station and head east on the H St/Benning Rd Line, what is the next station you will reach? Feel free to ignore station subtitles.